Obama's strategy seems to be Harry Truman's 1948 campaign against a "Do-Nothing" Republican Congress. Last week, for instance, David Goldstein of McClatchy Newspapers asked 1, "Has President Barack Obama been channeling Harry Truman?" Facing long odds in the 1948 election, Truman put Republicans in his campaign bull's-eye and unloaded on the "do-nothing Congress." He won, and conventional wisdom took a beating. This idea, which has been echoed by opinion makers ranging from former New York Times columnist Frank Rich 2 to Washington Post reporter Dan Balz 3, has given hope to Obama supporters demoralized by the current state of the economy. 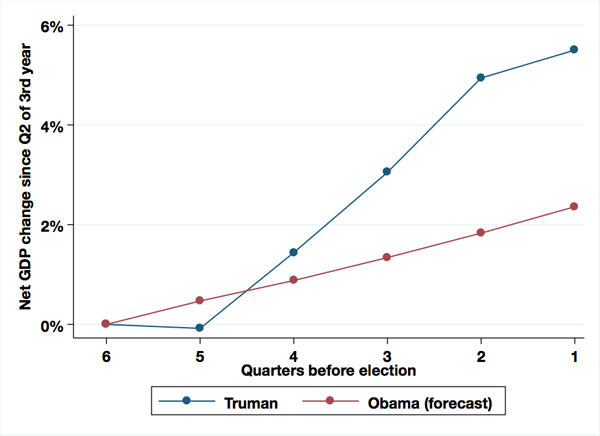 Obama himself has paid homage to Truman's strategy. During a Sept. 15 speech, for instance, he said 4: "[T]his Congress, they are accustomed to doing nothing, and they're comfortable with doing nothing, and they keep on doing nothing." 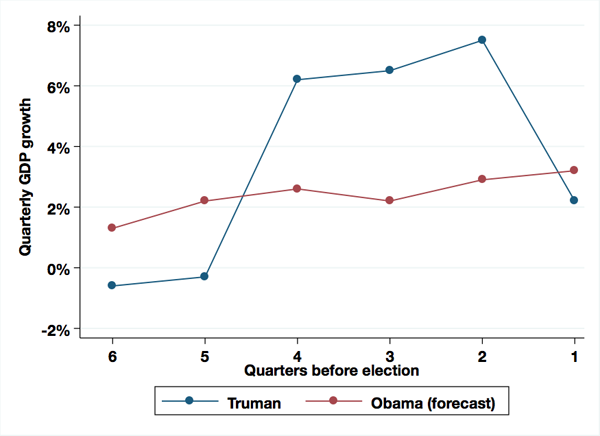 This well-timed surge in economic growth is likely to have played an important role in the success of Truman's campaign. By contrast, the International Monetary Fund just downgraded 8 its forecast for US economic growth in 2011 and 2012 to 1.5% and 1.8%, respectively.